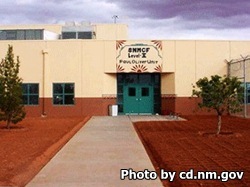 Southern New Mexico Correctional Facility is located on the West Mesa near Las Cruces New Mexico. It is a mixed custody facility that houses approximately 765 medium and minimum security inmates. Inmates incarcerated here can earn a GED and participate in vocational training during their sentence. Additionally, substance abuse treatment programs are available. All visitors must have an approved visitors application on file in order to visit an inmate. Inmates on Disciplinary status do not have visiting privileges.